Where do you find all robotic parts? 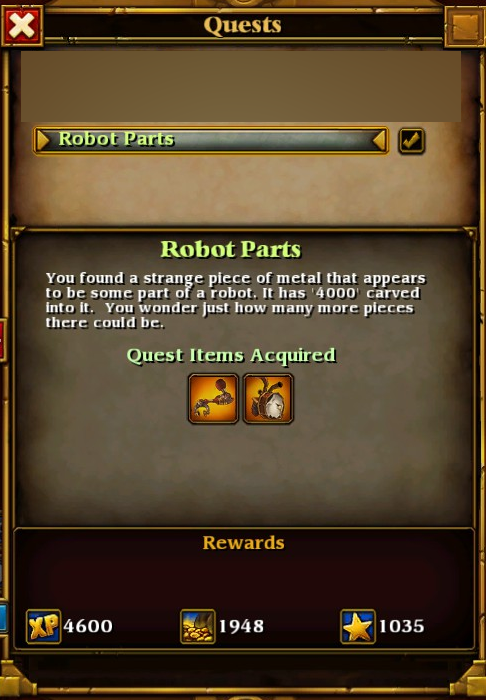 There are some robot parts in the game, that start a quest when found. So far, I found two, but I only remember that I got one in the "Temple of the Moon". In which dungeons do you find the different parts and what is required (how to solve the puzzle) to get them? You have to read all diaries and find four skeletons attached to wooden beams by axes, when you click on them you will hear ghostly wail and one torch on small graveyard lights up. When all four are "saved" door will open. You have to do this before teleporting to the boss, otherwise you have to enter that area again. Destroy all tree stumps, you should open hidden passage. But on my 2nd char its bugged, so maybe you will need to travel back to 2nd city to rebuild new map if that happens to you as well. But when all tree stumps are cut down, you will hear distinct sound. Than go around edges of map on one place logs will appear and create you way for last robot part. That should be all pieces - now you need to obtain power source from Main quest so its unmissable. Part located: on the left side of the exit area a passage will open. Part Location: to the right side of the exit area. Part Location: right side of exit break all the eggs. Quest related: This is part of the main quest. Part location: Read all diaries and release the 4 skeletons attached to wooden beams by axes. When all is done a door will open on the west side of the main map area. You have to collect this before teleporting to the boss, otherwise you have to enter thhe area again. Part Location: Destory all tree stumps in the zone, You will trigger a log bridge to be created in the center of the map leading to the north. Quest Related: Main Quest Last quest befor you unlock Act4. Part Location: obtain power source as part of the Main quest. If you have already turned the powersource in then just go talk to the NPC and the robot will be constructed. Your now Done collecting parts, 5 in total you should see them in your "Q"uest log on the tab for the robot quest. The Turn in NPC is located in the act 3 town. I found one (the head) in Cracklespit´s Realm in act 3, which you can enter by doing his/her (?) sidequest(s). I found one in the Swarm Temples... in the Salt Barrens Act 3 if I am correct. First part is in some frozen dungeon in ACT 1, where you have to lit all the braziers in order to open doors to secret room. What are the limitations of the demo? How do I fish in Torchlight 2? Where do I find the Minecraft tribute? Where can I find the Torchlight 2 save folder? Where can i find goblins? How many different phase portal challenges are there? What does this enemy effect icon mean? Redwolf passive skill: What are the chances for this passive to execute by skill level?